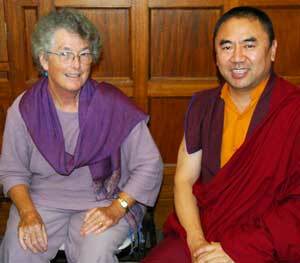 Jacqui's interview with Khenpo Ngawang Dhamchoe, Sydney May 2009. An MP3 version of this interview is also available. This interview with Kenpo was cut short, and Kenpo kindly offered to continue at a later date. This is the first part of the interview. I am talking here in Sydney, Australia, with Khenpo Ngawang Dhamchoe, head of the Drogmi Retreat Centre which is for the next five weeks hosting the visit of H.H. Sakya Trizin, his Holiness's sister - Her Eminence Jetsun Kushok Chimey Luding - over from Canada, his sons and other members of the Khon family, all gathered here to give the precious Lam Dre teaching, offered for only the third time in Australia. Khenpo's parents escaped from Tibet when the communists took over in 1959. Like many Tibetans at that time they endured many hardships before they reached safety. The family lost everything except their lives and started again from scratch in Nepal, later moving to India. When he was nine years old Kenpo joined the monastery and subsequently pursued his Masters and teaching degrees at the prestigious Sakya College in India. Having excelled in his studies, H.H. Sakya Trizen asked him to lecture at the college. In 1992 Khenpo was asked to teach in Singapore, Taiwan and Malaysia and then in 1994 he was asked to teach and run a centre in Sydney. After running this centre for 12 years, Khenpo was on pilgrimage in India at the end of 2006, when His Holiness asked Khenpo to return to Australia for the second time to become head of Drogmi Retreat Centre in East Kurrajong, to the west of Sydney. It is indeed a great privilege to have the opportunity to speak with you. There are several questions that I would like to ask you that I hope will allow you to express some of your ideas on the similarity and differences between Buddhadharma and psychological healing - as practiced in the West - versus Buddhadharma and healing practices in countries such as Tibet, India and Nepal - where there is a longer tradition of Buddhist practice. Cecilie Kwiat is a meditation teacher from the west of Canada with skill in crafting traditional meditation techniques to accommodate individual needs. Bill Genat is an Australian lay meditation teacher in Melbourne, Australia. Bill has been studying and practicing Buddhadharma for over 30 years. Ian Gawler is one of Australias best known cancer survivors and international advocate for ways in which people with cancer and other life threatening conditions can help themselves. ShantiMayi is the first westerner and woman in the ancient lineage of Indian Sacha Masters. Ven Robina Courtin is well known for her work with inmates in prisons in both Australia and the USA. Lama Choedak Rinpoche is the founder and Spiritual Director of Sakya Losal Choe Dzong, Rongton Buddhist College and Virupa Retreat Centre in Canberra. Khenpo Ngawang Dhamchoe is the Director of the Drogmi Retreat Centre on the outskirts of Sydney, NSW.